Think of podcasts like Blogs that you can listen to, rather than read. I listen to three personally, and you may know of many more. The term ‘Podcast’ originated with the popular iPod device from Apple. The iPod is a dedicated device for playing audio files. However, you do not need an iPod to play podcasts. Any computer will do, and most smart phones, as well as dozens of makes and models of ‘.mp3’ players. A podcast is a computer file, usually in the .mp3 format. What I’m talking about in this article is audio only, although podcasts can also include video. Audio podcasts are great to listen to as you’re driving down the road. You can listen to it from your computer, or you can download it to an MP3 player, or even to your smart phone. We use our smartphones and plug the audio into our radio (or use bluetooth) so we hear the sound from the radio speakers. Roadtreking is a weekly show by Mike Wendland who travels in a Roadtrek class B. With over one million downloads, this is a very popular podcast. Mike’s background is in journalism and it shows, he has been a correspondent for NBC News since the 90s, producing a weekly “PC Mike” segment about technology. You can listen to his podcast by visiting the Roadtreking podcast page, find an episode you want to hear and click the Play button. Mike, and his wife Jennifer, cover technology and RV tips, destinations, people and lots more topics of interest to RVers. Mike interviewed us (Jim and Chris of Geeks on Tour) in episode 9 of Roadtreking RV Podcast. His most recent podcast interviews Bobbi and Carl Braun. You’ll hear how they have a home in Hawaii, but prefer to spend much of their time RVing the USA! Living the RV Dream is a show by John and Kathy Huggins. They have been fulltime RVers since 2005. Their goal is to visit all the US National Parks. They also do a lot of volunteer work since hitting the road including working at the Escapees CARE center in Livingston, Texas. Living the RV Dream podcasts are produced weekly. They have written books about the FullTime RVing lifestyle, a very popular Facebook group, and they’re hosting their first Rally this October in Florida where Geeks on Tour will be presenting seminars. Their most recent podcast will give you lots of good information about Workamping. 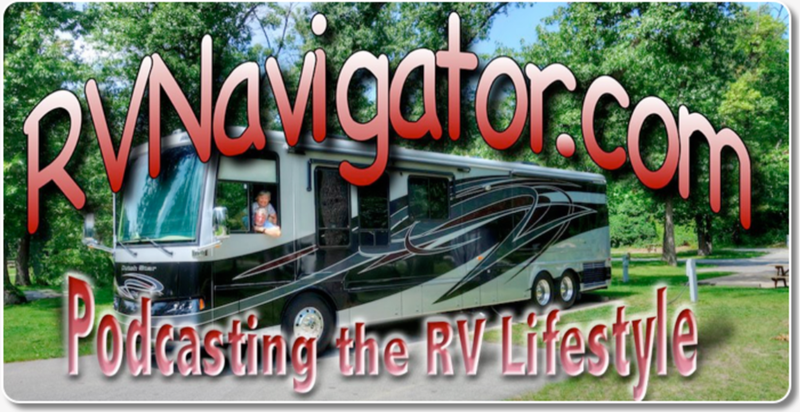 RV Navigator is a show by Ken and Martha Wiseman. As far as I know, this was the very first podcast about the RVing lifestyle and they’re still going strong with their latest podcast from September, 2015 about taking a Caravan trip thru the Maritimes. They have been extended RV travelers since 2005 and have podcast archives back to 2006. Their home is in Chicago. They also travel by cruise ship. Ken is a gadget king and you will hear a lot about Macintosh computers, iPhones, iPads and all things Apple from Ken in addition to RV and Travel topics. 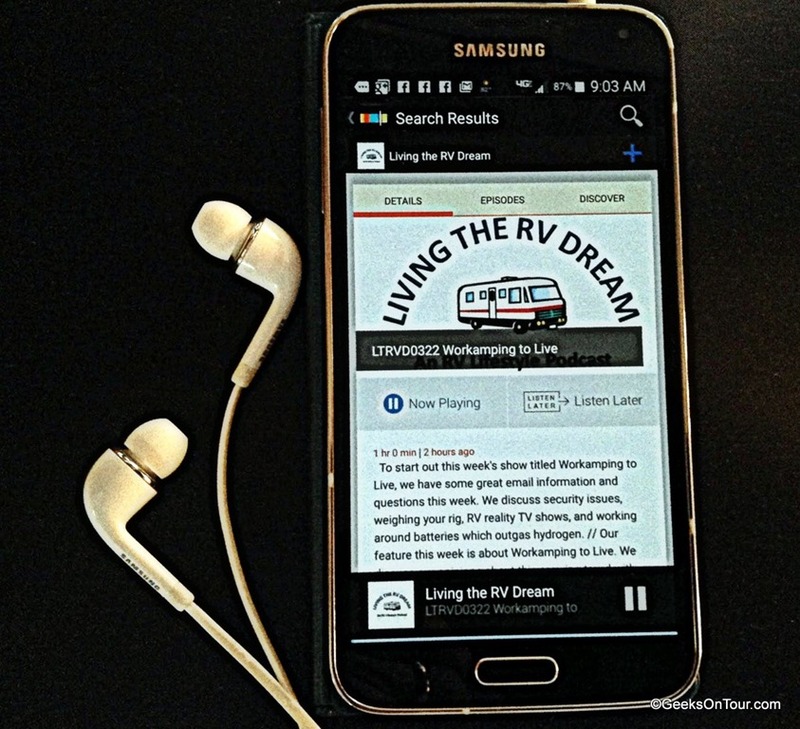 RV Navigator podcasts are produced once each month when they are traveling. Each podcast is about an hour long. How do you Play the Podcast? Every system will be a bit different. It has gotten easier over the years. Each of the 3 podcasts discussed above have simple Play Now, or Listen Now links right on their website under the episode description. If you click the ‘Play’ button, the audio will start streaming thru your computer and you can listen as it goes. You must be connected to the Internet for this to work. If you click ‘Download’, it will download the complete file to your computer – or whatever device you’re using to access this screen. After the file is completely downloaded, you can run it and play the complete file without an Internet connection. This is very handy for listening to podcasts while you’re driving. 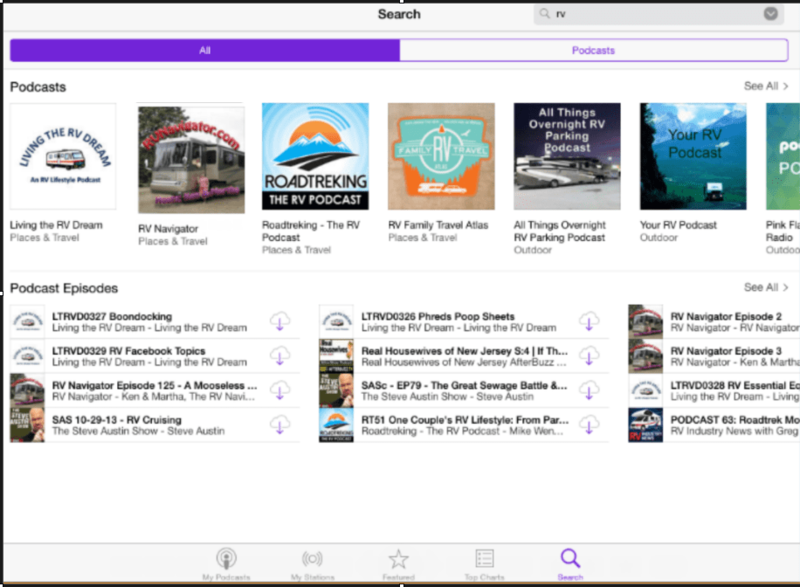 Using an app like iTunes Podcast or Stitcher, you can search thru hundreds of Podcasts and mark those that are your favorites. In the screenshot below, I searched for RV in the iTunes Podcast App and came up with the 3 I’ve mentioned, plus many more. Once you find them, you can ‘subscribe.’ That means, the app will keep track of when a new episode comes out. It will download that and delete ones you’ve listened to. If you want it to automatically download the episode to your device you can turn on the Available Offline feature so you can listen to it offline whenever you want. How about you? Have you found any good RV related podcasts? And, what is your favorite method for listening? This event was presented live on Sunday January 19, 2014 at 2pm. We demonstrate a few of our favorite tips about the power and the home button with Android and iPad. We also had Robin Seaver and Honey Burt with us. We know them from Sun City Hilton Head Computer Club. Robin teaches iPhone classes, and Honey also teaches about many different devices but her clear favorite is the Samsung Galaxy Note 3. In addition to the video recording, there is a link below to a document with notes about the tips we covered. The Geeks are ON TOUR. We start our summer from Florida and we’re headed to Colorado Springs for the RVSEF Lifestyle, Education & Safety Conference. This stop is a beautiful Florida State park. We talk about how we planned the stop using Streets and Trips with the free POI Megafile. You can read more about that with this article “Streets and Trips POI Megafile” If you’re a member, you can learn how to use Streets and Trips with the tutorial videos. Coming to you from upstate New York, this video was filmed inside the motorhome at Chris’s new office where she shows you how to turn a laptop into a desktop and Jim shows you his new iPad! He’ll even demonstrate how you can play our Show-Me-How Videos on the iPad while it’s sitting next to your computer. Just like having your own personal computer trainer at your side, but without having to set up a chair! We talk about many other things as well. Whenever a link can offer more information, we’ve added it below the video. In this video you get a look at our new (to us) motorhome. It’s a 2007 Gulf Stream Endura Diesel. Referred to as a Super C, it is 37 feet long with 2 large slides and the floor plan is a unique 3 zone layout. We love it. Using our new 4G mobile hotspot from Verizon we are able to present our seminars from our motorhome even thought the audience is 1,000 miles away. Check out the video to hear how we do it. We’re at the Tampa RV Super Show this week and we spent some time talking to the folks in the Verizon booth. They are selling the Mi-Fi 3G mobile hotspot device as well as the 4G USB modems. Watch the video to see what they have to say, then click on over to our Forum to discuss it. Coming to you from Fort Lauderdale, Florida, in this Gabbing with the Geeks we show you a little of our favorite pastime – Scuba Diving from our Kayaks. I hope we’re not rubbing it in too bad for our viewers who are buried in snow! Here are the Macintosh Tips Videos by Ken Wiseman.